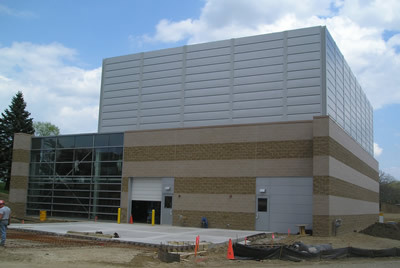 The North Campus Chiller Plant (NCCP) was completed in 2005 to provide chilled water to North Campus. The NCCP, when compared with individual building chillers, has resulted in energy savings, reduced operation and maintenance costs, increased redundancy and reliability, and reduced proliferation of cooling towers and the associated noise. In fiscal year 2009, the estimated annual operating cost savings due to the NCCP was approximately $200,000, with the majority of savings achieved with increased energy performance. We are now increasing the size of the facility by 8,500 square feet and add two 1,300 ton chillers, increasing the total capacity to 6,500 tons. In addition to the expansion of the NCCP, underground connections will be extended to provide chilled water to the Earl V. Moore Building, Space Research Laboratory, and Naval Architecture and Marine Engineering Building (NAME). The increased overall capacity of the plant will allow the elimination of the existing building chillers at the Francois-Xavier Bagnoud, Electrical Engineering and Computer Science, and George Granger Brown Memorial Laboratories (G. G. Brown) buildings, as well as provide cooling for the planned additions to G. G. Brown and the Michigan Memorial Phoenix Laboratory. The estimated incremental annual operating cost savings will be approximately $100,000 based on today’s cost, with the majority of savings achieved with increased energy performance. In addition, we will replace the steam and condensate interconnection between the Aerospace Propulsion Lab and NAME buildings to eliminate the need for one boiler.